Q. What is a ‘repairable’ chip? Also, we consider a chip repairable only if it’s located out of the driver’s direct view and doesn’t go to the edge of the glass. Q. Why should I get a windshield chip repaired? — Repairing a chip stops it from spreading and makes it look a lot better. — Most repairs are $60. Replacement windshields range anywhere from about $200 on up. Q. What is the lifetime of a repair? — Our repairs are guaranteed to hold for as long as you own your vehicle. Q. How long does it take to repair a chip? — A single-chip repair takes about 30-40 minutes. Q. What can I do before my appointment to keep the chip from cracking out? — Stay out of direct sunlight when it’s hot. — Defrost S-L-O-W-L-Y when it’s cold. — Put a piece of clear packing tape over the chip on the outside of the glass. The Factory Seal – Factory windshields don’t leak. Money – Our repairs are a fraction of the cost of a new windshield. The Earth – We’re keeping tons of broken windshields out of landfills..
Q. Why fix a chip right away? Chip isn’t contaminated with dirt, soap, wax, etc. Q. Why do windshield chips spread? Hot defroster on a cold windshield. Cold water on a hot windshield. Pressure, such as from a car wash.
Slamming the door with the windows up on a hot day. When the damage is larger than a half dollar. When the crack goes to the edge of the glass. When the chip is directly in front of the driver or passenger. Q. 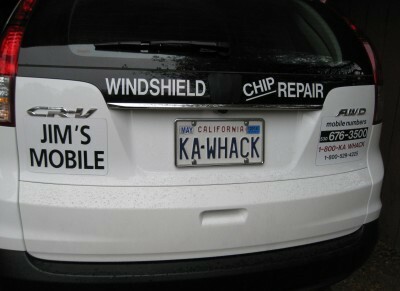 Why call the ‘KA-WHACK! !’ guy – (Jim’s Mobile) and not somebody else? Experience – 20-plus years’ worth. We do the best-looking repairs around. All of our repairs are guaranteed — lifetime, money-back . We handle all insurance paperwork. We come to you – mobile service to your home or work.